Manufacturer & Exporter of CO2 Dryer. Our product range also comprises of CO2 Recovery Plant, CO2 Storage Tank and CO2 Generation Plant. We are the trader of wide range of CO2 Dryer. 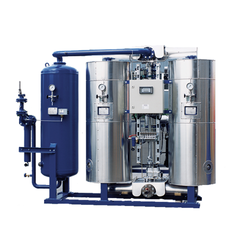 This is used to reduce or eliminate the impurities in gases such as helium, hydrogen, methane etc. These dryers are fabricated from quality approved raw materials under the guidance of qualified professionals. We are using best grade raw material and advanced technologies which are designed according to with high precision. Looking for CO2 Dryer ?